Sitting in the shadow of the 14th century Dunstanburgh Castle, the course wraps around the magnificent Embleton Bay, recently voted the best stretch of coastline in Britain. Designed by Open Championship winner and renowned course architect James Braid, Dunstanburgh Castle Golf Course offers a true test of links golf. And with the relaxed and friendly atmosphere of our clubhouse, visits to Dunstanburgh Castle Golf Club will live long in the memory. The 18 hole layout and testing sea winds provide golfers of all abilities the challenge of traditional links golf. Dunstanburgh welcomes visiting golfers throughout the year, with some of the best value green fees in the region. We are open to new members. We will soon be offering a range of memberships to suit all golfers. Set in an Area of Outstanding Natural Beauty, Dunstanburgh Castle Golf Course provides some of the most picturesque golf in Northumberland. Playing up to the ruins of the 14th century castle and with the sweeping sands of Embleton Bay, the breathtaking scenery can distract even the most focussed golfer. 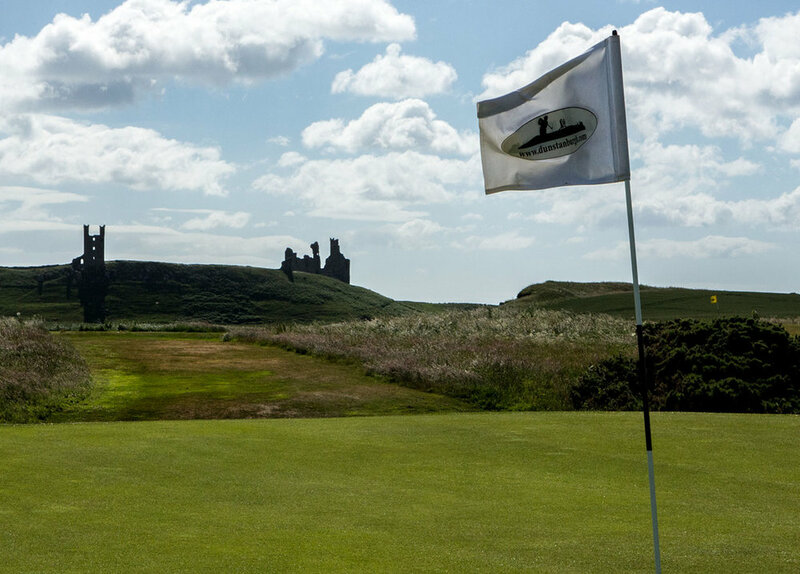 We have an active schedule of open events at Dunstanburgh Castle Golf Course, including the 3 Castles Tournament and the new 3-day Spring Open. We also have a range of singles, team and senior events organised by the Club committee. Our clubhouse provides a relaxed, friendly atmosphere for members, visiting golfers and the general public. Our staff are on hand to provide a warm welcome, with catering available throughout the day and plenty of car parking around the clubhouse.